It's been roughly one year since we last tested a Hyundai Elantra and not a day goes by that we haven't completely forgotten about it. In a competitive field of impressive compact sedans, the Elantra simply didn't leave an impression on us, especially not when specced in the SE trim with a gloomy shade of rental car white. In the past year, a number of wonderful new compact sedans have emerged including the stunning 2019 Mazda3 and the Elantra's Korean sibling, the bold new Kia Forte, making it even more difficult for the Elantra to stand out amongst the crowd. Not content to let other automakers take their sliver of dwindling compact sedan sales, Hyundai decided to inject the Elantra with some botox, giving it a more eye-catching appearance. But has the facelift worked, or is the Elantra simply stalling until an all-new model arrives? Hyundai sent us a 2019 Limited model so we could find out. The 2018 Elantra was a snoozefest, but at least this new model tries to be exciting. You can spot a 2019 model by its revised front fascia with a new grille and angular headlights. Around back, the taillights have been redesigned with a more exciting shape that still looks mundane alongside rivals like the new Mazda3 and the Forte. We commend Hyundai for trying to give the Elantra more adventurous styling but the front end just looks awkward in our eyes. We think Kia did a much better job styling the new Forte, which rides on the same platform as the Elantra. If the recently-revealed 2020 Sonata is anything to go by, we expect the next-generation Elantra to be much better looking. Not much has changed under the hood since last year because most Elantra trims are powered by a carryover 2.0-liter four-cylinder. We hope you aren't in a major rush to get somewhere because this mill only produces 147 horsepower and 132 lb-ft of torque, capable of hitting 60 mph in a lethargic nine seconds. A six-speed automatic is the only transmission choice on higher trim levels but the base SE model can be equipped with a six-speed manual. The tradeoff for the lack of speed comes in the form of excellent fuel economy. The EPA rates the Elantra at 28/37/32 mpg city/highway/combined but we averaged over 34mpg during our week with the car and we saw highway fuel economy reach as high as 43mpg, besting the EPA figures. For speed freaks out there, the Elantra Sport offers a 1.6-liter turbocharged four-cylinder sending 201 hp out through a six-speed manual or seven-speed dual clutch. There's also a frugal Eco trim with a tiny 1.4-liter turbo mill mated to a seven-speed dual-clutch. As with the drivetrains, the interior hasn't changed much since we last drove the Elantra. Hyundai's cabins are intuitive, even if you've never set foot in a car from the Korean brand. This Limited trim comes well-equipped with heated leather seats, dual-zone automatic climate control, power driver seat, and push-button start. Unfortunately for us, reviewing the car in Florida, the Elantra lacks the ventilated seats found in rivals like the Volkswagen Jetta and the Forte. It should be noted that the Forte has better materials than those found in the Elantra, which contains too many hard plastic surfaces for our tastes. We expect Hyundai to rectify this issue when it refreshes the Elantra in the next generation. The Elantra's interior is far from best-in-class but Hyundai's cabin technology is still impressive. Our Limited Tester included a $3,350 Ultimate Package with navigation, blind spot monitoring, a moonroof, forward collision avoidance, and driver memory seat. Hyundai's voice command works extremely well when entering navigation prompts and Apple CarPlay and Android Auto are also present to make the experience even easier. Cargo space is average for the segment with 14.4 cubic feet of storage, which is trumped by the Forte's 15.1 cubic feet. The seats do fold down easily via two latches located in the trunk, so the Elantra is plenty practical for a young, on-the-go buyer. Rear legroom is also quite good with 35.7 inches of space. As with last year's model, we came away a bit disappointed with how the Elantra feels from behind the wheel. Kia managed to inject the Forte with a sporty character that's absent in the Elantra. Steering is light and vague but can be made heavier when placed in Sport Mode. We often left the car in its Smart Mode, which switches between Normal and Sport Mode depending on how the car is being driven. Hyundai's six-speed automatic is starting to feel dated but it handles shifts with relative smoothness. We expect Hyundai to borrow the CVT out of the Forte for the next-generation Elantra, which should improve the smoothness of the drivetrain. This is clearly not a car you buy for driving enjoyment but the Elantra doesn't disappoint in terms of ride comfort. Over rough pavement and on the highway, the car performs admirably without too much road noise entering the cabin. Just don't try to overtake any sports cars. With the adaptive cruise control and lane keep assist active, the Elantra feels like it is on the cusp of driving itself, though it does require the driver to keep their hands on the wheel. The Elantra is backed by Hyundai's industry-leading five-year/60,000-mile warranty and 10-year/100,000-mile powertrain warranty, meaning it should be covered for most of the time you own it. Hyundai has had some issues covered under a recall, such as a problem with the airbag module. Some owners have also reported issues with electronics and drivetrain components. We wouldn't worry too much about reliability though, especially with the safety net of that awesome warranty. The base Elantra SE with a manual transmission is a rather cheap date with a starting price of just $17,200. Opting for the Limited trim with its vast range of features is a far more pricey $22,600 proposition. With the added Ultimate Package, our tester rings in at $26,960. Now through April 30, 2019 Hyundai is offering $2,250 off MSRP, which means a Limited would start at just $20,450. A word of advice: don't get the Limited Trim. Instead, we'd spend the same amount on the more powerful Sport trim, which starts at an identical $22,600 for the six-speed manual and includes an extra 54 hp. Opting for the seven-speed DCT increases the price by $1,100, so we'd gladly take the manual. You will lose the cool driver assistance technologies like adaptive cruise and lane keep assist but the $2,250 Premium Sport Package does add navigation, Infinity premium audio, and dual-zone automatic climate control for a total of $24,850, which is less than our Limited trim tester. The Sport trim also adds 18-inch alloy wheels, multi-link rear suspension, and more aggressive front and rear fascias. Styling is clearly subjective, so if you prefer how the 2019 Elantra looks, it may be worth the upgrade over an older model. But we feel there are some newer options in the segment, including Kia's own Forte, which match the Elantra on value while including nicer interior materials and features that are missing in the Elantra. 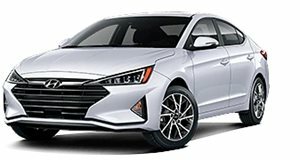 If we were to recommend a 2019 Elantra, it would be the Sport, which costs the same as this Limited model and caters more towards enthusiast buyers. But for now, we'd say you'd be better off waiting for the fully-redesigned Elantra and skipping this 2019 facelift. The Elantra is still a good value and features plenty of useful options, which is why it earns a rating of Worth A Look.